Here is another image from our recent trip to the Lake House. 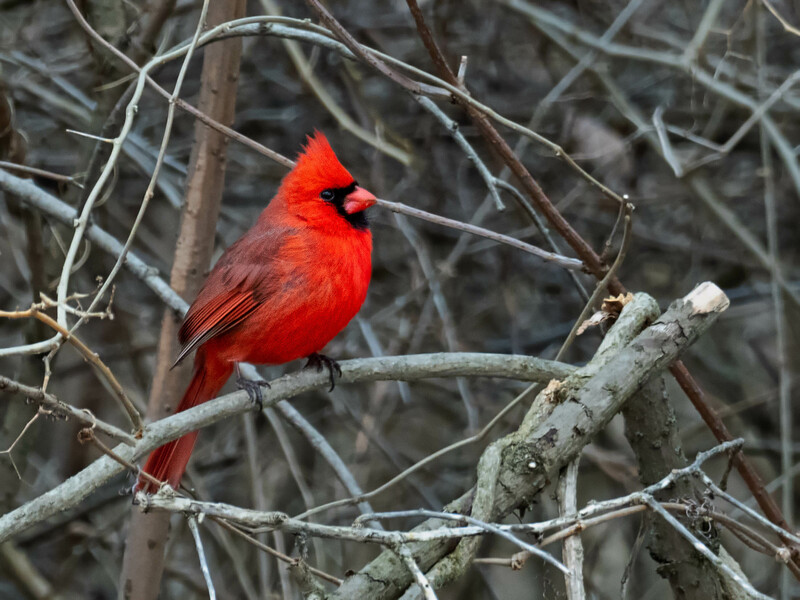 Our trees were populated with many cardinals and blue jays. I was able to conceal myself behind one of our large trees and watch the activity in the woods next to our property. The Male Cardinals were quite active and provided me with many opportunities to photograph their behaviors. Often times the Blue Jays would arrive and scatter the cardinals. Within minutes they would return to our feeders. If I moved even a slight bit, the Blue Jays would scatter and frighten off the rest of the birds. I needed to be patient and over time the birds would return to within my range of focus. The weather was a bit chilly, but with the proper clothing and hand warmers I was able to maintain my position and capture some great photos of these colorful birds.